Everyone is longing for a few sunny days on the beach in the middle of Winter and Australia can give you that and much more! 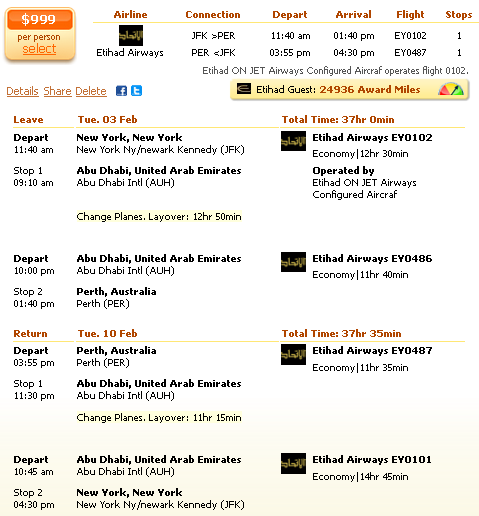 Take a look at this New York to Perth airfare deal with Etihad Airways and book it before it sells out! Fly in January and pay $999 r/t with taxes, which is less by more than $600 than the price of any other airline we checked.Although this Perth flight deal was found on Travelgrove, it was first provided by Faregeek. Search for the deal via the box, but you should check 3-4 providers to be sure that you have booked the lowest fare. On the screenshot you can see that you would depart from John F. Kennedy international Airport (JFK) on January 3 and fly back one week later from Perth Airport (PER). The departing flight has got a 12 hours 50 minutes stop in Abu Dhabi, while the return flight a stop of 11 hours 15 minutes. The Etihad Guest frequent flyer program will provide you with 24,936 award miles if you book this Perth flight deal. While the Etihad fare costs $999, the next cheapest flight – by Cathay Pacific – is $1,603. You can check the prices by searching in the above box. This entry was posted on Sunday, November 23rd, 2014 at 1:08 pm and is filed under Airfare Deals. You can follow any responses to this entry through the RSS 2.0 feed. You can leave a response, or trackback from your own site.